On September 16, 2017, during its annual meeting, the FGRA membership voted to dissolve the charity organization. The FGRA Board of Directors is taking the necessary steps to legally close down and disperse assets in accordance with IRS rules and regulations governing 501(C)(3) groups. Founded in 2005, FGRA grew rapidly to become the largest rodeo organization sanctioned by the International Gay Rodeo Association. 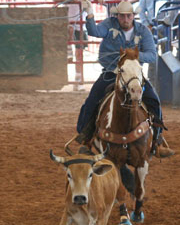 FGRA's annual rodeo and associated events and parties changed the social landscape in the greater Fort Lauderdale area. FGRA's all volunteer Board of Directors worked tirelessly to organize a successful and respected rodeo event while working to identify and fund charity organizations. Initial protests over the presence of a gay rodeo in the small town of Davie, FL gave way to acceptance and a sincere welcoming by the town's elected officials and its citizens. During its 12 years of existence, FGRA held eight rodeos, donated thousands of dollars to deserving charities, and elevated the presence of the LGBTQ community. The Florida Gay Rodeo Association was officially incorporated in the State of Florida as a Not for Profit corporation on May 20, 2005. On May 27th of that year, FGRA became the 23rd Member Organization of the International Gay Rodeo Association and scheduled its inaugural rodeo, the "Sunshine Stampede", for the Spring of 2006. By September of 2005, the FGRA roster topped more than 100 members. 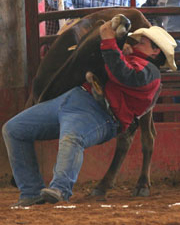 During the weekend of April 7th to the 9th, 2006, FGRA held its first rodeo at the Bergeron Arena in Davie, Florida. More than 100 competitors from the U.S and Canada participated in the rodeo which raised funds for three charities: Camp Boggy Creek, EASE, Poverello. 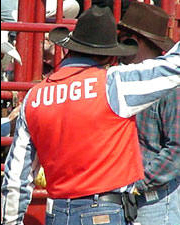 In 2009, the Georgia Gay Rodeo Association disbanded. As a show of good will with their sister organization, FGRA placed all GGRA members on the FGRA membership list in order to allow them to compete for the remainder of the rodeo year. In April of 2009, FGRA sponsored a Country Western Cruise to complement the upcoming rodeo weekend and the 4th edition of the Sunshine Stampede. In June of 2009, the FGRA roster topped 400 members and the association votes to create a Royalty Program. 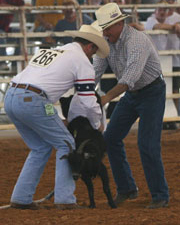 In April of 2012, FGRA held the 7th edition of the Sunshine Stampede Rodeo. However, the following year, the FGRA Board voted to not have a rodeo but to instead focus on membership activities and shoring up the administration of the association. In late 2014 FGRA officially changed its name to the Florida Georgia Rodeo Association and expanded its service area following approval by IGRA. This action finally closed the gap that was created in 2009 when GGRA closed its doors. The tremendous amount of work required to manage an organization the size of FGRA, and which spanned the geography of two states, would prove to be daunting for the FGRA Board of Directors. As social trends changed, membership renewals dropped, and fewer volunteers would step forward to help with critical functions like fund raising and member outreach. Eventually, no volunteers would step forward to serve on the association's Board of Directors. FGRA's closure was based on a thoughtful deliberation by the Board of Directors and was a business decision made based on the reality of today's social environment. Other rodeo associations in the IGRA family are also struggling with this same dynamic and several have ceased operations.